Why professionals choose just VFFOTO polarizing filter for even the harshest weather conditions? How VFFOTO polarizing filter greatly improve your photos? Increases color saturation, highlights clouds in the sky, removes glare from water, glass, and plant leaves. Increase the contrast for images of distant landscapes and removes air bluish haze. The effect of the polarization filter can not be simulated later on the computer. Capture your true blue sky and bright and vibrant colors - thanks to the VFFOTO polarizing filter! The circular polarizing filter filters out reflected white polarized light that causes less sharpness and loss of image contrast. Effect rate is set by rotating in the frame. Depending on the position of the incident light: The CPL most strongly acts in the side light (perpendicular to the direction of the incident sun rays). With the sun in the back or in direct sunlight, the effect is minimal. The circular polarizing filter is a sandwich of two glasses and a cellulosic polarizing film between them. The film is sensitive to dampness (it can also destroy high humidity) and should be protected. Cheap brands do not solve this problem. At all VFFOTO polarizing filters, the polarizing foil is glued all-around and, in addition, it is completely air-tight. 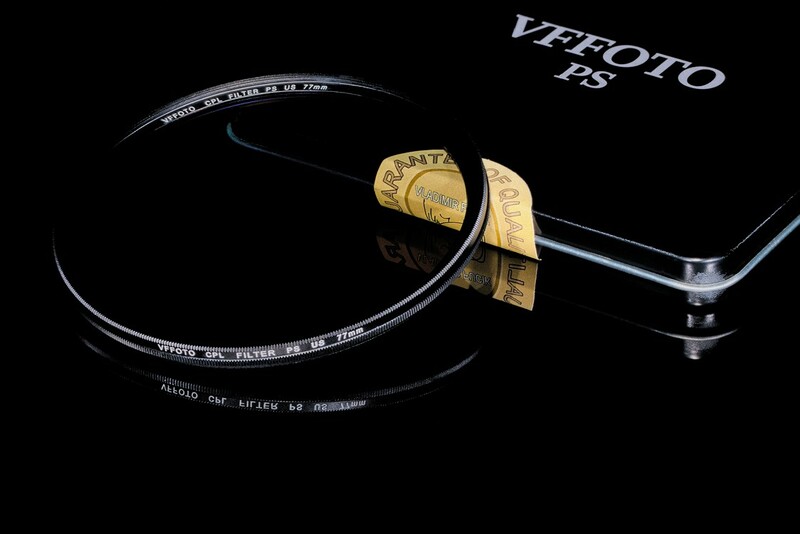 VFFOTO circular polarization filters are used by professional photographers in the most extreme climatic conditions! Why choose VFFOTO polarizing filter? version III - high-quality optical glass Schott B270, aluminum slim frame, 7 + 7 anti-reflective layers, 3 nano layers, special polarizing film sealing, 16-800 mm focal lenses FF, color shift to little warm tones. US (Ultra-Slim) version - high-quality optical glass Schott B270, aluminum ultraslim frame - only 3.6 mm, use of standard caps, 7 + 7 anti-reflective layers, 3 nanolayers, special seal of polarizing foil, useable for 15-800 mm focal lenses (FF), color shift into slightly warm tones. CoN (Colours of Nature) version - high-quality Schott glass, aluminum slim frame, 7 + 7 anti-reflective coatings, 3 nanolayers, special seal of polarizing foil, useable for 16-800 mm focal lenses (FF). magnetic system - high-quality optical glass Schott B270, magnetic slim frame - only 3.8 mm, system is deliverd with own caps, 7 + 7 anti-reflective layers, 3 nanolayers, special seal of polarizing foil, useable for 24-800 mm focal lenses (FF), color shift slightly into warm tones.